Sometimes you may want to add exclusive content for mobile users. In Mail Designer 365 you can make changes to your design so that certain layout blocks will only be visible in the mobile version. 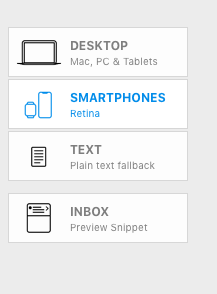 After you’ve dragged a block into your mobile design, you will notice the layout block is now labelled ”MOBILE ONLY.” This indicates that this particular layout block will only be displayed if the recipient is reading your newsletter on a smartphone or mobile device and won’t be visible in the Desktop view.